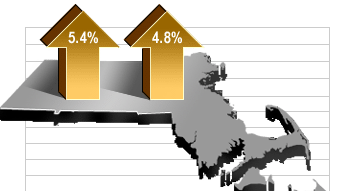 The Massachusetts unemployment rate rose slightly – to 4.7 percent in November from 4.6 percent the previous two months, according to the State Executive Office of Labor and Workforce Development. According to the Bureau of Labor Statistics, the overall number of jobs in Massachusetts grew by 5,900 in November and has grown by 67,700 so far this year, exceeding the total number of new jobs added to the economy in all of 2014. Massachusetts reported a mixed picture on jobs for September: the state unemployment rate dropped to 4.6 percent, despite losing 7,100 jobs. According to the Massachusetts Executive Office of Labor and Workforce Development, Massachusetts’ unemployment rate dropped 0.1 percent between August and September. The current rate of 4.6 percent is down from 6 percent in September of 2014. Nationally, the unemployment rate is 5.1 percent. Job losses were felt in the education and health services sector (estimated 4,700 jobs lost) and trade, transportation, and utilities (estimated 3,000 jobs lost). Construction lost a seasonally-adjusted 2,000 jobs and manufacturing businesses cut 1,700 jobs. Massachusetts’ unemployment rate remained at 4.6 percent in June, its lowest point since before the recession began in 2007, according to the Massachusetts Office of Labor and Workforce Development. The state added 10,500 jobs last month, making June the tenth straight month of job gains for Massachusetts. The biggest job growth reported was the professional, scientific, and business services sector, which added 5,200 jobs. About 30 percent of all jobs added in Massachusetts over the past year were in this sector, including jobs in the biotech industry. Nationally, the unemployment rate is 5.5 percent.